"Characterization of Carbonaceous Airborne Particulate Matter in Wilmington, Delaware"
"Identifying Biomarkers of the MHC Gene to Investigate Chemosensory Discrimination"
"Towards the Synthesis of Lycopladine A"
"Role of Protein-Protein Interactions in Controlling Prox1 Function"
"Effects of Diminished Protein Synthesis on Bone Anabolic Response to Load in RPL29-deficient Mice"
of prostate cancer to bone"
"Design of a Cell-Responsive De-PEGylation DNA Delivery System"
Undergraduates who presented talks at the Sigma Xi competition. 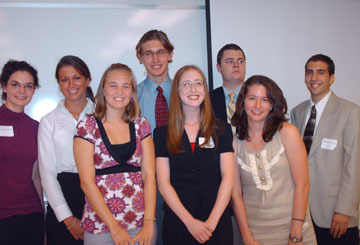 Back Row (left to right) Ann Benavidez, Allison Kasmari, Mike Pirnot, Tyler Bazzoli, and Steve Zucker. Winners of the Sigma Xi Competition with Dr. Carl Schmidt, president of the local chapter of Sigma Xi. 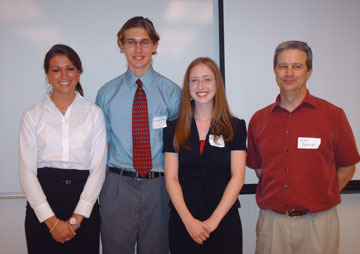 Left to right- Allison Kasmari (third place), Mike Pirnot (second place), and Laura Sloofman (first place). 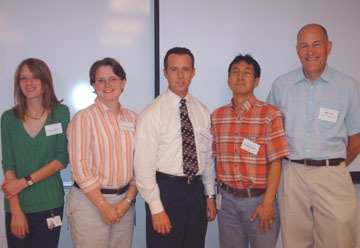 Judges from local industry who served as judges for the Sigma Xi competition. 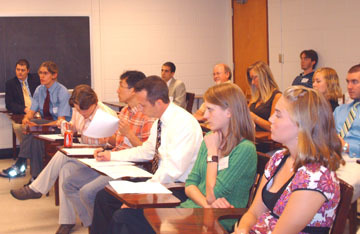 Unversity of Delaware Undergraduate Research Program, University of Delaware Howard Hughes Undergraduate Program.